A six-year cooperative study of quail on two western Oklahoma wildlife management areas has confirmed that weather and habitat influence sizable fluctuations in the number of birds each year. 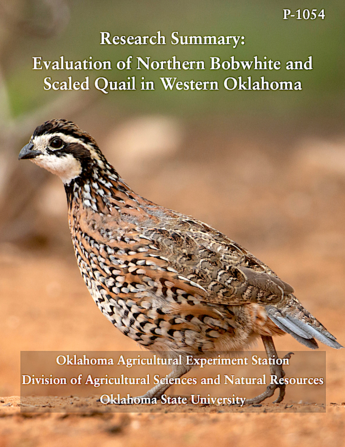 This finding was among several important results that are detailed in a report titled “Research Summary: Evaluation of Northern Bobwhite and Scaled Quail in Western Oklahoma” recently released by the Oklahoma Agricultural Experiment Station in the Division of Agriculture Sciences and Natural Resources at Oklahoma State University. Due to concerns about declining quail populations, this cooperative quail study between OSU and the Oklahoma Department of Wildlife Conservation was established in 2011 on the Packsaddleand Beaver River Wildlife Management Areas. Broadly, the project was intended to document survival, nest success, brood success, habitat selection, genetics and movement of quail. The effects of hunting, energy development, prescribed fire, disking and temperature on quail were also examined, as well as an evaluation of various monitoring techniques for quail. Surface water helps to concentrate quail but does not help to increase the number of quail. Quail survival is affected more by extreme cold (near 0 degrees F) than by extreme heat (near 100 degrees F) as long as shrubs were available for loafing and shade during the hot weather. About one in five bobwhite nests contained eggs from two different hens, which could indicate a survival strategy of mixing genetics in a single clutch. Strip disking did not show much benefit on Beaver River WMA due to the amount of open ground and forbs favored by quail already present. This study was conducted by student technicians with funding from the Wildlife Department, grant administration by the Oklahoma Cooperative Fish and Wildlife Research Unit, a research assistantship from John Groendyke, and the Bollenbach Endowment. The report, P-1054, a brief overview touching on findings resulting from the full study, is available for viewing online at https://www.wildlifedepartment.com/sites/default/files/E-1054%20Quail%20Research.pdf.